Bolsheviks and Nazis alike practiced collective punishment. The Reds would take hostages against “good behavior” of residents of a town and shoot them if any resistance was offered. Nazis would sometimes kill everyone in a town near which one of their troops perished. We look at such practices with abhorrence, though US and Allied bombings probably killed a few innocent bystanders of their own. As a culture, we don’t view collective punishments as acceptable…or do we? When one insane man in the UK murdered a group of kids in 1987, hundreds of thousands were punished for his sins. British gun owners were deprived of their guns and not given a choice about it. That was collective punishment in its pure form, affecting only people who had no connection to the crime at all. By that logic, if someone stabs another person with a fork, it would be acceptable to confiscate the contents of your kitchen drawer. If someone deliberately uses any tool at all to harm others, then your rights would be violated. Collective punishment pushers say: “but it’s not just one bad person misusing those tools!” Granting that, why would mis-use of a tool by two people justify violation of your personal rights? Or by any number of other people — even if you are the only person in the world who is peaceful and non-violent, so why should your forks be seized? 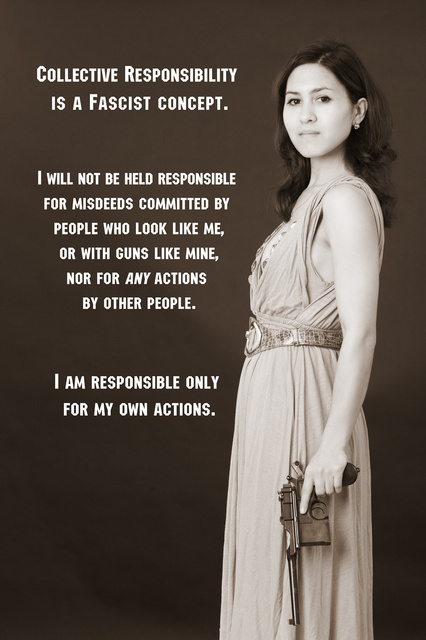 The problem with gun control and other control schemes is that they violate individual rights deliberately, sometimes with excuses and more often by the “might makes right” principle. And that’s precisely how much of the world ended up disarmed in the face of totalitarian menaces. If a person approaches you and says “please walk with me”, you can consider the request and either oblige him or refuse. But if the same person says “walk with me or I will kill your parents/you/some other person”, then the substance of the order is irrelevant. The person showed the willingness to harm you and should be defeated as soon and as decisively as possible. What makes gun control such a special case is that complying with the initial demands progressively reduces your future ability to refuse further demands on your life, liberty and property. Sometimes people comply anyway, trading concessions for time to escape, to regroup and seek allies or to wait out the imposition. But those who oppress others never rest, and I don’t think that we want to give up our homes just to escape from such menaces. The evasion is happening, as exemplified by the New Jersey and Illinois residents relocating to more gun-friendly states. Re-grouping and allying with like-minded people is also happening, with national and state legal initiatives to roll back gun control. The fighting hasn’t yet started because, unlike gun control pushers, pro-gun people are not sociopaths. We don’t use force when other options are available, even if that gives us imperfect and time-deferred victories. And that’s why a few hundred thousand gun control pushers living among the tens of millions of politically active gun owners are still alive. They failed to push hard enough to be treated as an immediate, dire and inescapable threat. And, in the end, our guns merely hold gun control pushers at bay. The victory over that unethical ideology will come from the cultural rejection of collective punishment. In my lifetime, Brady creatures and their ideological allies will be viewed with the same derision as the Ku Klux Klan. This entry was posted in civil rights, rkba, self-defense, Uncategorized and tagged ethics, history. Bookmark the permalink. Taking hostages is time honored tradition. As well as collective punishment. It just depends what collective you want to punish. What about SS or SA or learned scientists from Unit 731? The same tactics were uses here in Australia when the so-called ‘Port Arthur Massacre’ happened in Tasmania. It was used to largely disarm Australian citizens. Great article. I would only add that if the capacity to do evil is what we are trying to mitigate, why does the US maintain the largest nuclear and chemical weapon stockpile in the world? It’s not about fairness, and its not about safety. It’s about control. Good, solid poster and well stated accompanying essay. My only kvetch is the generalization of the word “fascist” where what you mean is “totalitarian.” I know the accurate word is less evocative but using the one that feels stronger leads to distracting silliness. Stalin was a totalitarian dictator but calling him a fascist would be smirk-worthy. This post is fantastic. I find it particularly poignant that it was written by a man who did not spend the first years of his life being taught the finer points of firearms ownership/use in the US, where his rights were protected by the 2A. Perspective truly makes a difference. The man has literally “seen behind the curtain”, to borrow a phrase from the Wizard of Oz. Something similar has occurred in the area of drunk driving. Very few accidents are caused by people with BAC levels in the .08-.1% range, yet in an effort to be seen as getting tough on drunk drivers the legal limit has been cut to .08% in California. As a consequence many people are afraid to have even one beer or with a meal if they have to drive. The analogy to dealing with speeders by reducing the speed limit is clear in both cases. While in the Army, we non-coms were repeatedly told NOT to use “mass punishments” or anything resembling them, with the troops. Strictly verboten. However, the officers used mass punishment (calling it discipline just added salt) on non-coms and lower enlisted on a regular basis. That’s just their policy. Funny how a little power turns people into both hypocrites and madmen. The officers always seemed to wonder at our lack of enthusiasim in a lot of things. They’ve also learned that NCOs are assholes and to avoid taking any problems to them. Therefore, fewer problems are reported. That is the point I’m trying to reach with my boys. They have this nagging need to tell on each other, to the point where there must be punishments. I keep telling them that I don’t want to hear it, that their mother doens’t need to hear that, etc. I think the oldest is starting to get it. I wonder whether that Mauser 712 machine pistol she’s holding is real or a replica. The pistol is a plain 10-shot semi-auto fixed-magazine Mauser 96 with the original holster stock. Fantastic. When was it manufactured? I don’t have it on hand, but it’s pre-WW1, perhaps c.1910. Олег, возможно ли сделать перевод на русский? Я могу конечно и сам, но если бы перевод появился именно у Вас в журнале, это было бы очень хорошо. Я бы разместил ссылку на эту статью на http://www.facebook.com/zbroya.info Это организация, отстаивающая право украинцев на короткоствольное оружие. Они размещают различные материалы по этой тематике на своей страничке в фейсбуке, и на своём сайте http://www.zbroya.info Данная информация была бы чрезвычайно полезна! Yes, just need a few days to do that. If there is no such thing as collective responsibility, why do we seek war reparations? We’re collecting from the hostile government as a unitized entity. Then the deliberate firebombings of civilians at Dresden, Hamburg, Tokyo were collective punishments and thus fascist? Because the civilians weren’t responsible for the war. The politicians were. The bombing of Hiroshima and Nagasaki were fascist? I agree. They were all nothing but the worst mass-murders in the 20th Century, and should be called such. While I have my reservations about whether or not the fire bombings of Dresden and Hamburg were necessary, I believe the the bombings of Hiroshima and Nagasaki most likely ended up saving more Japanese lives if the Allies have had to invade the home islands than what were taken in both bombings. Government officials were training Japanese schoolgirls to charge U.S. Marines with pikes as they landed. Add to that that every Japanese civilian was expected to “gloriously” die for their Emperor using whatever farming or gardening implement they could get their hands on. As horrible as the after effects of Hiroshima and Nagasaki were, I believe an invasion would have been much worst. The bombings in war. Including the atomic bombings. Were strategic and tactical actions undertaken to achieve broader objectives and the destruction of the ability/desire to continue the war. These were acts that occurred in the context of a war that was undertaken by the nation-state, of whom these cities/civilians were willing and even active members in the cause. The concept of “collective punishment” as in this essay is where an individual acts as an individual in an anti-social manner, using some tool as a weapon. A gun, a knife or some other weapon, or weaponized tool. The “collective punishment” is when the entire rest of the population has its rights to use that tool, to have access to that tool, eliminated or severely limited, by fiat. We are not considering the actions of a nation state in war, but an overly controlling government in peace. A government that sees its job as to control the population. There are plenty of laws against murder and mayhem. Those who want more laws limiting freedom are not seeking regulation but control. We have seen that collective punishment does not work. The only logical result is the complete elimination of the population being “punished.” It didn’t protect the Nazis from continued harassment by guerrillas. If anything it promoted even more resistance. Especially so in Russia where there was a sufficiency of land for the guerrilla bands to hide and operate from. Collective punishment doesn’t eliminate resistance, it actually increases it. In the USA we have a huge nation geographically with a “long” history of freedom. Resistance will not be futile. The Japanese civilians were, in effect, the hostages of their Army and Navy. Being unable to offer resistance made them easier to take hostage in the first place. Very good essay – it was linked over at our site which is how I found it here. I shall bookmark this site. Oh, and Edward seems to have forgotten who started mass bombing of population centers as a tactic of war.